President Lincoln’s Cottage at the Soldiers’ Home in Washington, DC is the most significant historic site directly associated with Lincoln’s presidency aside from the White House. During the Civil War, Lincoln resided seasonally on the grounds of the federally-owned Soldiers’ Home, just over three miles north of the Capitol. From June – November of 1862-64, Lincoln commuted daily by horseback or carriage from the Soldiers’ Home to the White House. Today, the Soldiers’ Home still commands spectacular views overlooking the city. Here, the Lincolns prized this breeze-swept pastoral refuge for its relative privacy yet proximity to Washington’s city center. Lincoln met with Cabinet members, political allies and adversaries, and he enjoyed spending time with his family there. He also studied war strategies and pondered the course of leadership in this setting. 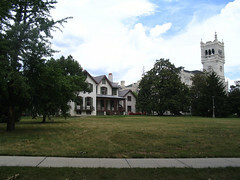 Most importantly, Lincoln developed the policy of emancipation during his first season residing at the Soldiers’ Home, the summer of 1862.On July 7, 2000, President Bill Clinton signed Presidential Proclamation 72 which established the site as a National Monument.In cooperation with the Armed Forces Retirement Home, the National Trust for Historic Preservationis preserving and restoring the Lincoln Cottage to become the premier historic site for public education about the Lincoln presidency. The site will open to the public to visit in February of 2008. Please provide public transit information on the web site. Visiting a resident at the Home would need to be coordinated separately with that resident and the AFRH. Per our agreement with the Home, our visitors are only permitted to enter our visitor center, the Cottage, and the landscape immediately surrounding both. Thanks for asking!